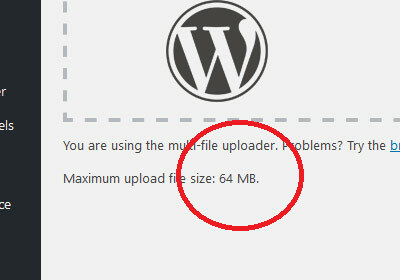 The file upload limit of a WordPress site is often limited. No matter where the site is uploaded, whether localhost or a live server, wordpress upload file size limit mostly depends on the hosting server. The limit basically starts with 2048 KB or 2 MB and is some cases 3 MB. This size might look okay if you are uploading text or office files such as .txt, .docx, .pptx and even some low-res images. But it surely won’t be enough for heavy media type files (such as mp3, mp4 etc), high-res images and even some pdf files. When you want to upload them, you see your WordPress upload file size limit is max 2MB. What are you going to do now? Compress the file size? Use another server? 😛 . Just kidding, you can set the WordPress upload file size limit from your WordPress folder in a few lines of code. So without wasting anymore time, let’s do this. Save the file now and go back to media page. You should see the limit has increased. If you want to change the size, you can do this right away. Just change the size limit again in the .htaccess file. Since you saved the file, you will now see the new limitation appears on your add media page. So, I hope the process was easy to follow. If you are still confused somehow, I captured the whole process in a 02.22 min YouTube video which you can check out right now. If it helps you, give a like, leave a comment and subscribe for future uploads.